We are looking for a stuffed bunny made by Dan Dee. It has a lavender body and ears, with white face, hands and feet. Originally, it was scented with lavender in the tummy. 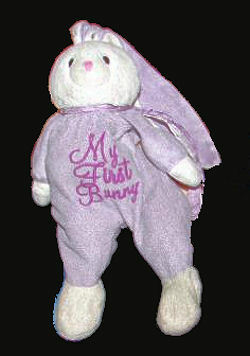 It has “My First Bunny” embroidered on its tummy. This was my son’s ultimate lovey! It went literally EVERYWHERE with us. It was never out of his sight, even for a moment. While shopping in a large department store during a busy holiday season, my son dropped “Bunny”. I finally realized it was gone and searched the store over. I went back every week for over two months to see if someone turned it into Lost and Found. No luck. He (and I) have been heartbroken that it’s gone. If anyone has any idea how to find this bunny, please, please, please let me know. I have scoured EBay and the net, but cannot find a lavender version of the bunny. Thank you!!! If you can help Sherry find this DanDee Lavender My First Bunny Rabbit, THIS SITE IS NO LONGER ACTIVELY MANAGED. Please use Our FREE FACEBOOK GROUP, including #010408-4 in the subject, . Are you still looking for this bunny? There’s one on eBay# 250334505669. Oh I was!!! Anastasia, you just made my year! Seeing that bunny brought tears to my eyes and I bought it right away. I cannot thank you enough! You’re very welcome. I’m glad your long search is finally over, what a great start for a new year.